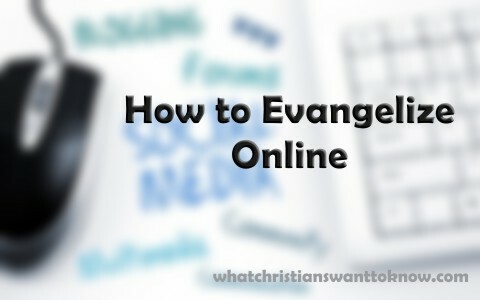 How can Christians evangelize online, through Facebook, Twitter, Instagram, or any other social media? Evangelism is essentially the proclamation of the good news of the gospel of Jesus Christ and we are given an imperative command from our Master and Lord to “Go therefore and make disciples of all nations, baptizing them in the name of the Father and of the Son and of the Holy Spirit, teaching them to observe all that I have commanded you” (Matt 28:19-20). There is no plan B. We must do what He commands. It’s not negotiable. Most of us won’t be able to go into all the world but we can at least go next door, to our family, our co-workers, and to our friends, but today, it seems like the “great omission” because few are willing to face the scorn or rejection when they share the gospel. The word “evangelism” comes from the Greek word “euaggelion” which means “good news” and in the verb form, it’s “to bring good news.” To not do so is a sin of omission and in my opinion, worse than a sin of commission. In this case, it’s being derelict of our duties to proclaim Christ to all people. Why evangelize? Because we are commanded to do so and we’re not given an “out” to not do so. The saying, “law to the proud but grace to the humble” is perfectly fitting for the presentation of the gospel. If you walked into a doctor’s office and the receptionist handed you a prescription and said, “Okay, you’re good to go, just take this” you might ask, “Why? What’s it for?” You probably wouldn’t take it because you didn’t know why you needed it. On the other hand, if you had visited the doctor and he or she showed you the test results of your blood work and showed you the x-rays and said, “You’re going to die if you don’t take this,” then you’d gladly take it, right? You’d be eager to take the first pill immediately because now you know you’re going to die if you don’t. In a similar way, until you are first hit with the diagnosis (the wages of death, Rom 6:23), you wouldn’t just take a prescription for no reason (grace), so the lost need to hear that they’re in deep trouble with God and have the wrath of God abiding on them (John 3:36b). The Apostle Paul speaks to the unsaved by telling them it is “because of your hard and impenitent heart you are storing up wrath for yourself on the day of wrath when God’s righteous judgment will be revealed” (Rom 2:5). Not one of us is good enough to be saved, and in fact, the Bible says “None is righteous, no, not one” (Rom 3:10) since “All have turned aside; together they have become worthless; no one does good, not even one” (Rom 3:12). So, how do we use social media to evangelize if we can’t reach everyone we need to? Some people have created their own blog website. These are free and easy to set up. On one blog I have, I can translate the article into Aramaic or into the Hindu tongue just for those who can’t read English. There are many free language translators on the web. Non-English speaking people may have no other way to hear what God’s Word says until you allow them to read it in their own native tongue. Some use short little messages on YouTube and YouTube has the ability to add subtitles into another language for the very same reason. There is also Facebook where people can post things on the Internet and provide links to different websites and adding Scripture can help explain why you posted what you did. There’s also Instagram, Twitter, and other social media outlets that allow you to post biblical articles or quotes of Scripture that point people to their need for Christ (first) in the hopes that they will run to the Savior for salvation. There are even emails that you can forward message to or embed links for them to read. It’s not your responsibility to save anyone…it is their response to His ability but it is our responsibility to tell them. We will have to give an account to God someday and stand before Him and explain why we were being underground, silent witness pew potatoes instead of going out into the world. Tragically, one pastor told me that they just pray that people will come into their church to be saved but I suggested that they do what Christ did and that was to seek and to save those who are lost. Jesus didn’t wait for the one sheep to come back by themselves; He left the 99 to seek out the one that was lost. If people aren’t coming to church then the church should be going to them. We don’t have to trust our own resources, our slick presentations or make the gospel message attractive. We only have to trust the power that’s found in God’s Word. The Apostle Paul said “I am not ashamed of the gospel, for it is the power of God for salvation to everyone who believes, to the Jew first and also to the Greek” (Rom 1:16). God’s Word has power of its own. Isaiah the Prophet said of God’s Word, “so shall my word be that goes out from my mouth; it shall not return to me empty, but it shall accomplish that which I purpose, and shall succeed in the thing for which I sent it” (Isaiah 55:11). Our words have no such power but when we use God’s Word, that unleashes the very power of God as again Paul writes, “the word of the cross is folly to those who are perishing, but to us who are being saved it is the power of God” (1 Cor 1:18). God’s Word is its own power source and it is God Himself. I would say the same thing about a woman of God by what I believe: It takes a man of God with the Word of God and the Spirit of God to make the children of God for the glory of God. Paul asks us all a question: “How then will they call on him in whom they have not believed? And how are they to believe in him of whom they have never heard? And how are they to hear without someone preaching” (Rom 10:14). I believe St. Francis of Assisi was wrong when he said, “preach the gospel and use words when necessary.” The truth is, words are necessary since faith comes by hearing and not by seeing, and so, “how are they to preach unless they are sent? As it is written, “How beautiful are the feet of those who preach the good news” (Rom 10:15), even if the gospel is preached via social media. Whatever way you can share the gospel, do it, in order to “save others by snatching them out of the fire; to others show mercy with fear, hating even the garment stained by the flesh” (Jude 1:23). Thank you for your thoughts on online evangelism. If anyone wants to share the gospel through social media and you don’t have a blog or website, you can refer to this website explains the gospel in a simple way to unbelievers and people who do not know about Jesus or God. It is available in the main 20 languages or so. Hello Simon. I checked out your website and couldn’t find anything about evangelism at all. I could find nothing on repentance and faith, or belief, which is what Jesus said the gospel was all about (Mark 1:14-15) but thank you anyway sir. Links are not used on comments. I’m someone who is completely clueless about any type of evangelism. I don’t think ‘ll ever have the guts to preach the gospel to anyone. Who can I turn to guidance in this respect. I try to help at least once a week by running a van for a nonprofit food distribution service for various churches in the area but I know I need to do more. I can write okay but I’m not much of a talker. I appreciate your time and effort. Hello Mr. Duque. Tomorrow, I am preaching in a state mental hospital. This past week they had 2 fights at the institution, but I am still going, God willing, to preach Sunday. Am I a bit fearful? Yes, I must admit, but I guess I fear disobeying Christ’s command more than the fear of man or my own self being harmed. The fear of man is a stumbing block. Talk to your pastor. Jesus sent them out two by two, so if you have someone to team with, that gives you more confidence. One can witness…while the other is praying, but God alone gives the increase (Acts 2:46). If you have Facebook, you can share Scriptures online and wait for responses. For example, 1 Cor 15:3-4 is the gospel in a nutshell, but so is 2 Cor 5:21, so do the best you can and remember not to fear man or rejection. Fear God more. Talk to your pastor about what you can do for an Outreach committee or if they don’t have one, start one! The power is in the Gospel (Rom 1:16; 1 Cor 1:18), not in us, so unleash God’s Word and pray for His Spirit to take it to their hearts. We are commanded to Go (Matt 28:18-20)…evangelize or fossilize. Praying for you sir. Previous post: What Is The 4th (Fourth) Commandment In The Bible? Next post: What Is The 5th (Fifth) Commandment In The Bible?